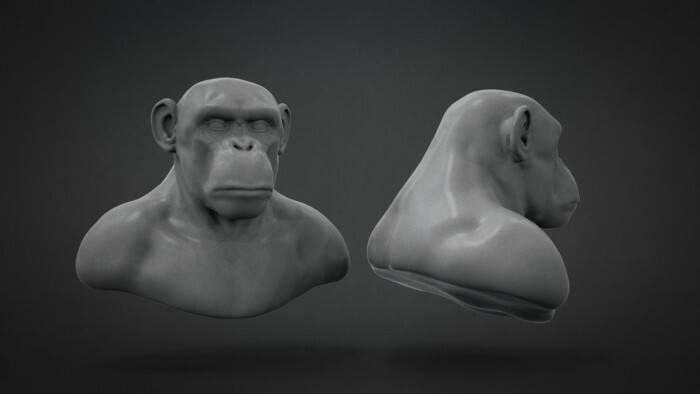 In this chapter we will be blocking out the chimpanzee with a Dynamesh sphere using the skull as a guide to maintain accurate proportions. 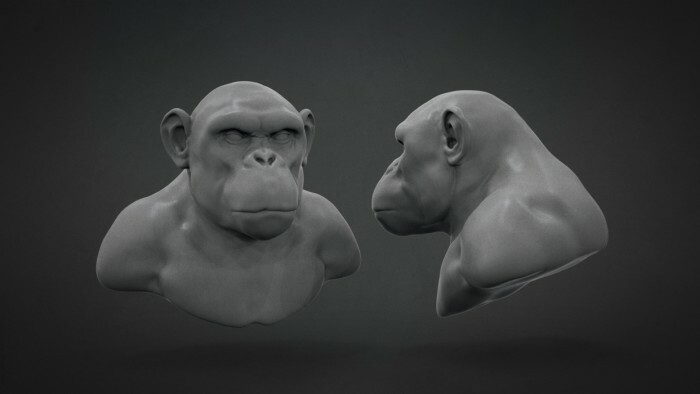 In this chapter we continue to refine the chimpanzee bust further, using the skull as our guide and studying our reference to ensure an accurate study. 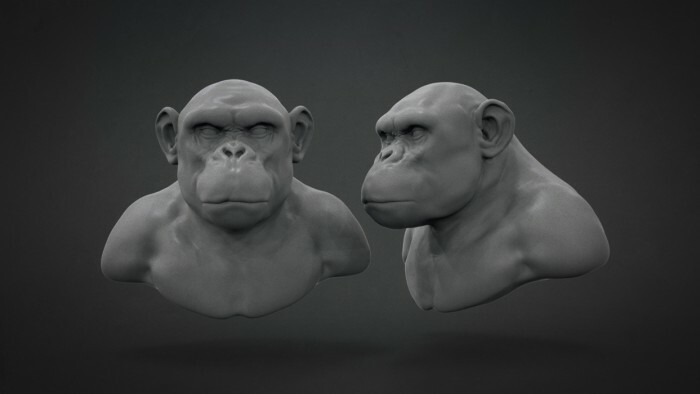 Now that the chimpanzee is blocked out and its general proportions are in place, we use ZRemesher to make a cleaner mesh that allows a full range of subdivision levels as we push forward and refine the proportions of the eyes/mouth/ears. 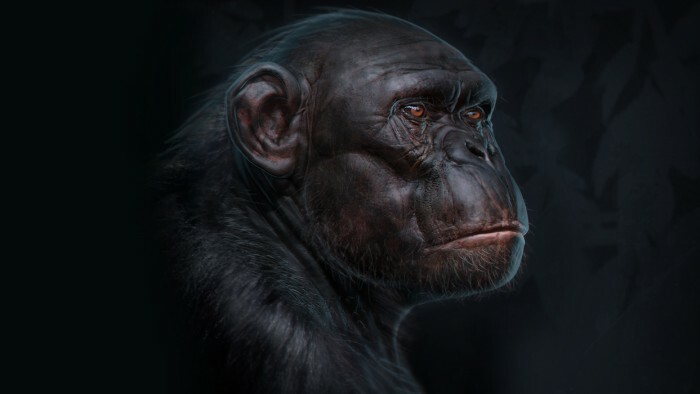 In this chapter, we continue to refine the proportions and details of the chimpanzee, studying our reference and starting to define and think about the character we are trying to create. 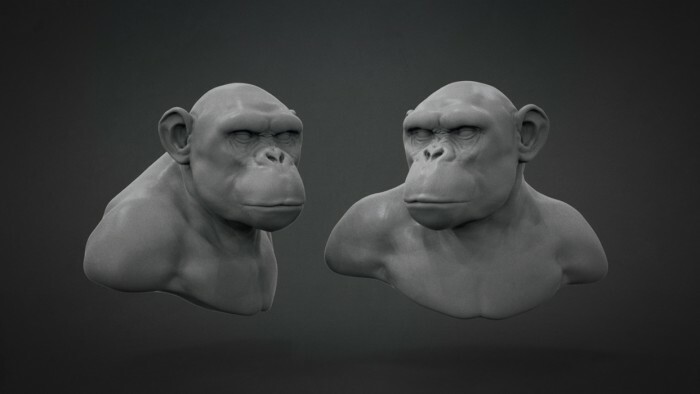 In this chapter we continue to refine proportions further and also start to add more surface details through our sculpting tools and creating custom alphas in Photoshop. 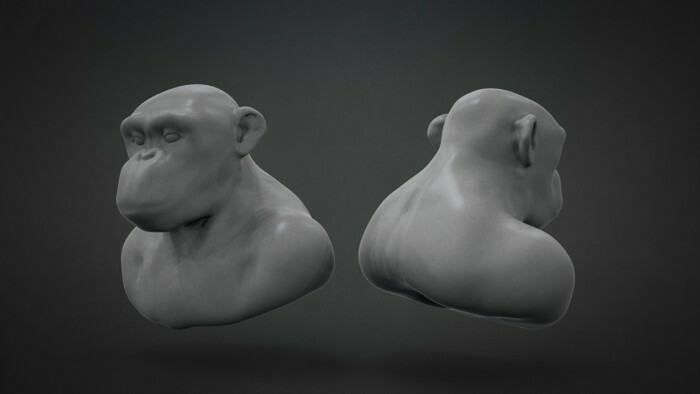 We then import and use them on our model in ZBrush. 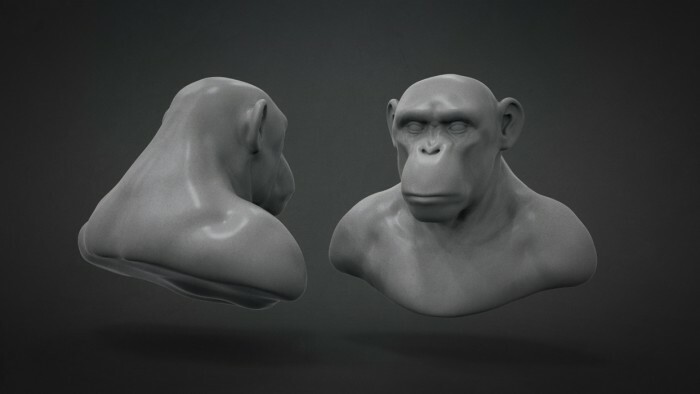 In this chapter we continue to refine the proportions of the chimpanzee, working on the relationships of the head and neck then begin to pose the shoulders to add more life to the character. 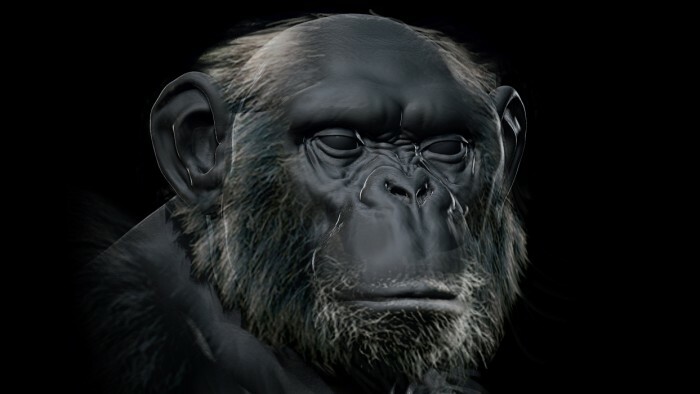 In this chapter we export some renders and compile them into Photoshop to do a quick paint over to help give us an idea of what this chimpanzee might look like and also help us to define the character further. We continue in Photoshop using elements from our photo reference before returning to ZBrush. This is sort of the halfway point in the sculpt, allowing us to familiarise ourselves with the subject matter and explore other possible directions. In this chapter we refine and lock down the character before polypainting the model in ZBrush in preparation for our final rendering. We also utilise some surface noise and 'mask by cavity’ to get added definition in the sculpture. 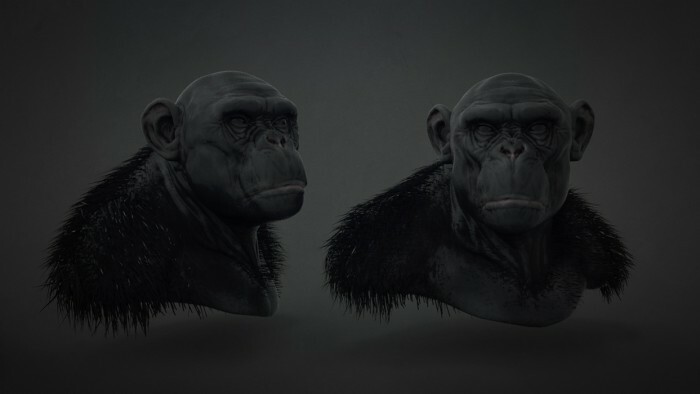 In this chapter we continue to refine the Polypainting and explore Fibermesh in ZBrush to achieve some base layers of fur on our chimpanzee, exploring a few ideas before locking down the final direction. 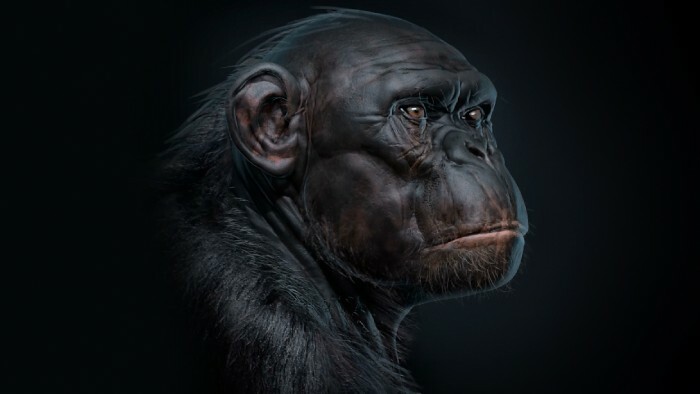 In this chapter we choose a final pose for our model then render and export various materials and start to compile them in Photoshop as we create our final illustration of our chimpanzee using a combination of painting/photos/materials. In this chapter we cover some post processing techniques and final tweaks as we finish the illustration for presentation. 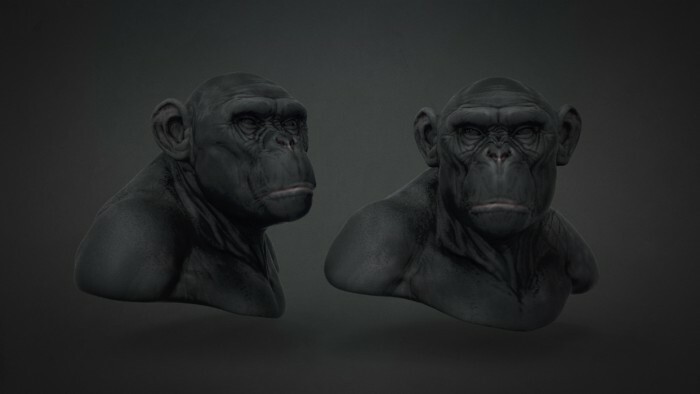 In this twelve part tutorial, internationally renowned Artist and Instructor Ben Mauro continues to work within ZBrush 4R6 taking us through his process of creating a highly realistic Chimpanzee Bust from a simple three-dimensional sphere. 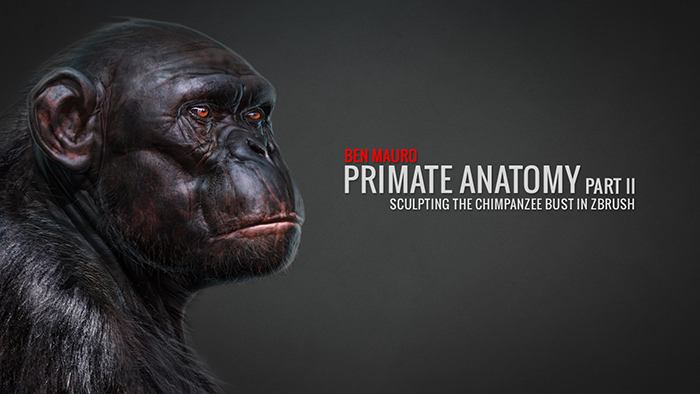 He builds upon his primate skull created in his previous tutorial and demonstrates how to best utilize reference material to create desired results. Ben discusses how he renders, exports and brings sculpts into Photoshop before using a number of photobashing tips for added realism. Ben Mauro is a US born concept designer and digital sculptor. He studied industrial design and entertainment design at Art Center College of Design in Pasadena, California. After college he relocated to Wellington, New Zealand where he worked at Weta Workshop from 2009- 2013, over that time he contributed to a vast array of Film, Television and Videogame projects such as ‘The Hobbit Trilogy’ and ‘Elysium’ among many many others. 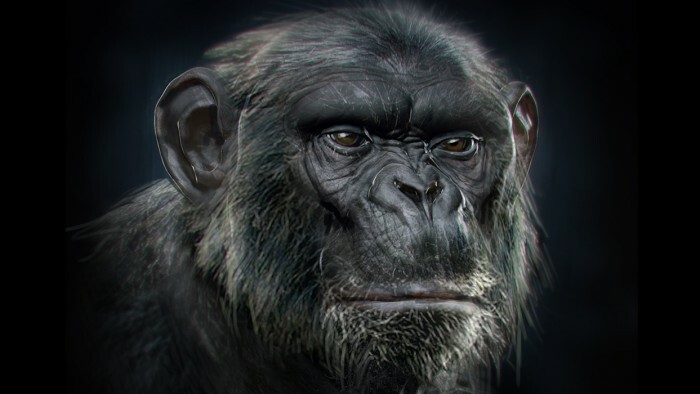 Before coming to Weta he worked as a freelancer for various clients including Boston Dynamics, Treyarch, LucasFilm, Rhythm & Hues, Activision, EuropaCorp, Universal Pictures, Sony Pictures Animation, Insomniac Games, Design Studio Press and Vishwa Robotics. In 2013 he moved to Singapore working as an independant freelance concept designer where he continues to offer his design services to clients around the world. Copyright © 2019, BadKing.com.au Page generated in 4.11 seconds ( 100.00% PHP, 0.00% MySQL ).